Modern Rectangle Address Plaque Meets 911 Codes - - address plaque with easy to read crisp Modern Font 4" numbers. Wall mount. Made in USA. 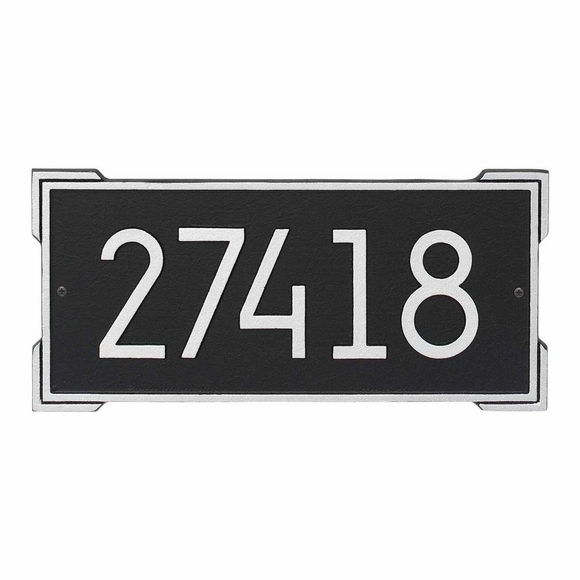 This is the address sign with Larger and Bolder high visibility address numbers that are easy to read from the street and help EMTs, fire, police, and other first responders locate your house more quickly in emergencies. The clean contemporary font and on-trend color options also make this house number sign big on curb appeal. Large image shown in black with silver. Smaller images (from left to right) are black/silver, aged bronze, coastal green, oil rubbed bronze, pewter/silver, and white/black. Border, double corners, and numbers are the same color. Dimensions: 16.25"W x 7.75"H x .325; weighs 3 pounds.